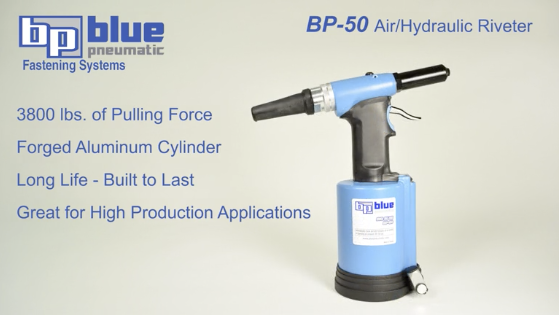 The BP-53V is like our heavy duty riveter, Big Blue, but without the steroids. Big Blue Junior has the power of the large “heavy duty” riveters in the body of a small one. This tool simply has more pulling force than other tools in its weight class. This is our “full range riveter”. This pop rivets gun tool sets 3/32, 1/8, 5/32 and 3/16 rivets in all materials. Big blue Jr. is ideal for multi-grip rivets and pulls 3/16 Monobolt/Magna-lok structural rivets. This tool provides an economical light-weight solution to placing a wide range of rivets. Nose pieces and service wrenches are included. Recommended operating air pressure is 85-100 psi. Weight 4 lbs. 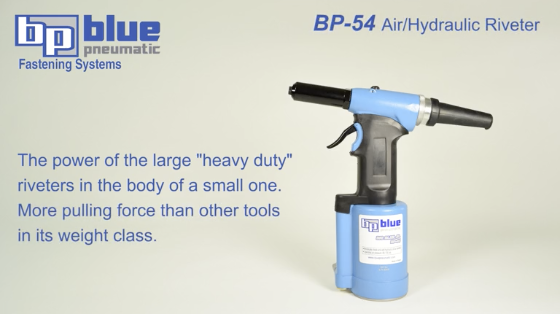 The BP-54 is like our heavy duty riveter, Big Blue, but without the steroids. 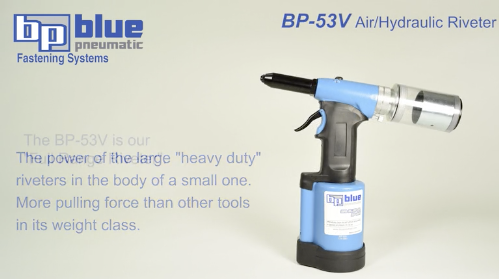 Big Blue Junior has the power of the large “heavy duty” riveters in the body of a small one. This tool simply has more pulling force than other tools in its weight class. This is our “full range riveter”. This one is loaded with pulling force at 3800lbs. This is a heavy duty air/hydraulic riveter. Big Blue sets rivets from 1/8 through 1/4 in all materials and is ideal for Monobolt/Magna-lok and other structural rivets. Its 7/8 stroke allows this rivet tool to pull most structural rivets in one stroke. More power and a forged aluminum cylinder means long life. Big Blue is built to last and last. Great for high production applications. Meet the new generation of riveting tools. The BP-4V riveter is a combination of all the most useful features. The BP-4V riveting tool has the best weight to power ratio in the industry, boasting 3500lbs of pulling force. 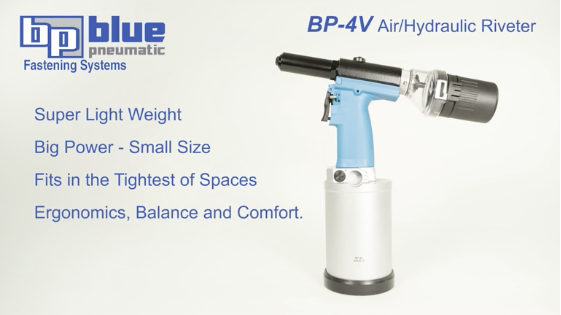 It can set 1/8,5/32, 3/16 and 1/4 rivets in all Alloys, including Monobolt and Magna-lok structural rivets, most in one stroke.The BP-4V Rivet Gun is super light weight, allowing the rivet gun to be operated continually with great comfort. The rivet tool is expertly designed too. Look no further for the best in ergonomics, balance and comfort. This tool has a convenient, thumb-operated on/off vacuum control switch to control compressor air consumption while it holds the rivet in place in the nose tip. Rivet tool comes complete with nose tips for 1/8, 5/32, 3/16 and 1/4. Also included are wrenches for service and oil applicator. Recommended operating air pressure is 80-95psi. Weight 3.6 lbs. Meet the new generation of riveting tools. The BP-3V riveter is a combination of all the most useful features. 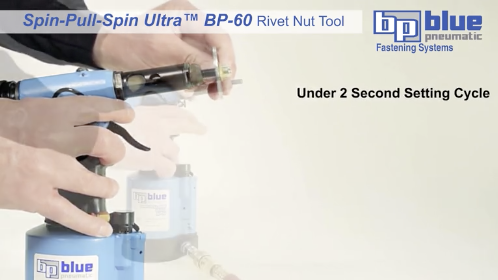 The BP-3V riveting tool has the best weight to power ratio in the industry, boasting 2100lbs of pulling force. 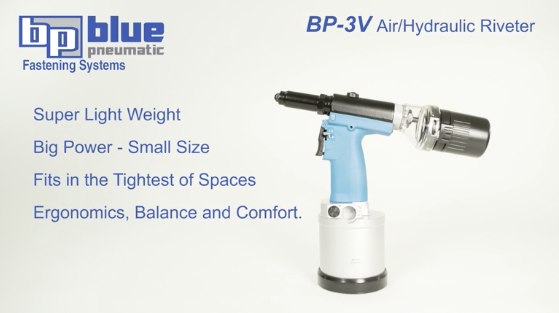 It can set 1/8,5/32 and 3/16 rivets in all Alloys, including Monobolt and Magna-lok structural rivets, most in one stroke.The BP-3V Rivet Gun is super light weight and small, allowing the rivet gun to fit in the tightest of spaces. The rivet tool is expertly designed too. Look no further for the best in ergonomics, balance and comfort. This tool has a convenient, thumb-operated on/off vacuum control switch to control compressor air consumption while it holds the rivet in place in the nose tip. Rivet tool comes complete with nose tips for 1/8, 5/32 and 3/16,. Also included are wrenches for service and oil applicator. Recommended operating air pressure is 80-95psi. Weight 3.2 lbs. Whether you need a blind rivet gun for small, hard to reach areas or a big and powerful tool to complete a construction scale project, this tool is an indispensable part of any man’s kit. There is an extensive selection of these tools available today, ranging from small and compact hand guns to bigger, heavier weight tools with a lot of pulling power. If you don’t own one yet, here are five powerful reasons that you should. The pulling force of these tools can range from as little as just over 1500 lbs to over 7000 libs, depending on the size. If you need a hydraulic or air tool that packs a lot of punch, blind rivet guns are well worth investigating. Because they are heavy duty, penetrating tools, they can be used relatively easily on any type of material. If you purchase a really powerful tool, you should be able to place most rivets accurately and quickly with only one stroke of the gun. Even when they are used frequently or on big jobs, blind rivet guns work hard and last for a long time. That means, if you have two tools that you can’t decide between and are tempted to buy the cheaper one just to save a bit of money, it might be more cost-effective to pay a little more and get a lifetime’s use from it. For first-timers, nosepieces can make using the tool very easy. If you haven’t used one before, make sure you buy a pack with nosepieces that include 1/8, 5/32, 3/16 and ¼ bits. This way, even if you don’t know which size you need to complete the job, you have all the pieces you need to work it out. An oil applicator and wrenches can make services and maintenance easier at home. Of course, the most powerful tool is always the most desirable, but it usually means the tool is heavier and harder to use. You need to find a balance between finding the tool that makes the job quickest, without draining you completely, in terms of your budget or your physical energy. This means you need to choose a tool that allows you to insert most blind rivets in only one stroke, while being easy to handle and manage. If you only need to press one button to get the fastener to spin on, then most of the work is done for you. When you have a big project to work on, or one that requires you to spend many hours toiling over something complex, one-touch functionality will make it quicker and simpler. All you will need to do afterwards is pull the fastener and then spin the rivet nut out of the fastener when you pull the release button. If you choose a fast setting cycle (of around 2 seconds) you are likely to experience less thread deformation, and require fewer rivet nuts to do the job. A fully adjustable tool will allow for more accurate rivet nut placements. It also makes the tool ideal for people who are less experienced or skilled. Adjustability allows you to adjust the stroke quickly and easily. The tools you choose should have a selection of different sized mandrels so you have everything you need to get started. This is especially important if you are a beginner. A pulling force of around 6800 lbs is more than adequate for most home do it yourself jobs. The tool you select should also be lightweight, however, so that it is easy to use. If you have a big project to finish and you use a heavy tool, it can get extremely tiring and take a lot longer to finish. If you are using the tool for industrial or construction scale projects, it might be worthwhile looking into a tool that has a counter-weight option, which can help to overcome user fatigue.